Indian Economy is growing rapidly with increase in population and energy needs. It is the need of hour to opt for clean, cheap and reliable sources of energy to save our country from carbon emissions. The government of India has come up with Jawaharlal Nehru National Solar Mission to promote ecologically sustainable growth while addressing India’s energy security. Currently total solar installed capacity is 24.3 GW (as on Oct, 2018).Solar capacity in India is backed by financial incentives through several policy-based incentives and subsidies offered both by the central as well as state government.Solar power projects can be set up anywhere in the country, but scattered projects would lead to higher project cost per MW and higher technical losses.The solar capacity largely constitutes utility scale grid connected capacity and ultra-mega solar parks. Solar Parks or photovoltaic power stations are designed for the supply of commercial power into the electricity grid, and these provide developers an area that is well characterized with proper infrastructure and access to amenities in a concentrated large areaand where the risk of the projects can be minimized. Solar parks supply power at the utility level, rather than to a local user or users. 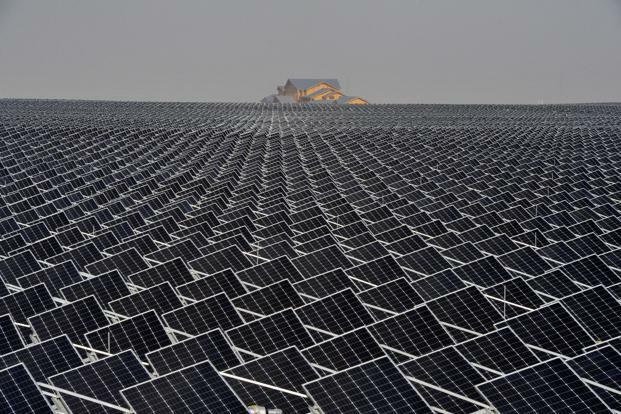 Ultra-Mega Solar Power Project size ranges from 0.5 GW to 3 GW. UMSP have a potential to bring down the cost of Solar Power.MNRE is facilitating solar park developers by reducing the number of required approvals. The scheme envisages supporting the States/UTs in setting up solar parks at various locations in the country with a view to create required infrastructure for setting up of solar power projects. The solar parks provide suitable developed land with all clearances, transmission system, water access, road connectivity, communication network, etc. The scheme facilitates and speeds up installation of grid connected solar power projects for electricity generation on a large scale. All the States and Union Territories are eligible for getting benefit under the scheme. The capacity of the solar parks shall be 500 MW and above. However, smaller parks are also considered in hilly states and states where there is acute shortage of non-agricultural land. The solar parks may be developed by the agencies of the State Governments, CPSUs and Private Entrepreneurs. The implementing agency is termed as Solar Power Park Developer (SPPD). Under the scheme, MNRE provides Central Financial Assistance (CFA) of up to Rs. 25 lakh per solar park for preparation of Detailed Project Report (DPR). Beside this, CFA of up to Rs. 20.00 lakh per MW or 30% of the project cost, including Grid-connectivity cost, whichever is lower, is also provided on achieving the milestones prescribed in the scheme. Currently installed capacity of solar parks are approx 4 GW which contribute 16-20 % in total installed capacity of solar. Solar developers are showing good response in the bids pertaining to solar parks due to low risk factors. From the above table, it can be observed that % of solar energy generated from Solar Park out of the total clean energy generated is 7% and percentage of solar generationoutof the clean energy generated as per the CEA data is 25%. Hence, it can be inferred that solar parks are contributing significantly in the overall solar generation. Also, it can be seen from recent bid results that all lowest tariffs realizedin solar bids are for solar park bids only. As per clean energy target, India is planning to add 40 GW of solarcapacity from solar parks out of 100 GW of solar capacity which is 40% from the existing 20%. In the current scenario, states are also tending towards development of solar parks in their states in order to achieve their RPO targets. One of the major advantages because of which solar developers are positively responding to solar park bids is land acquisition which is addressed in the solar park mechanism. With the present scenario, solar parks have potential to become back bone in the total clean energy installed capacity. Therefore it is suggested that Government of India should continue its support to Solar Park scheme and focus more on addressing the issues being faced in solar parks on priority for achieving expected results for the continued support of SPPDs in the government’s clean energy mission.